Rabbits were once a highly prized delicacy, farmed for the rich man’s table. Wild rabbit is smaller than the tame variety, with a mildly gamey flavour. It is lean and virtually fat-free with no chemical or food additives as growth promoters, and it has all the advantages of chicken without the problems of a mass produced factory product. 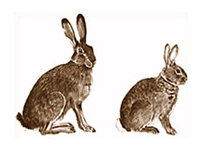 Hare is considerably larger with darker gamier meat.